"Xbox 360 Elite is the newest addition to the Xbox family that includes a huge 120GB hard drive (the largest available for any gaming console), a high-definition multimedia interface (HDMI) cable, and a premium black finish. 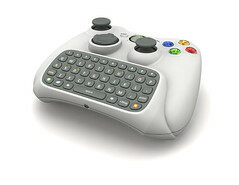 The Xbox 360 Elite also includes a black wireless controller and black Xbox Live® headset." The Halo 3 Beta period has been announced as May 16th - June 6th. A few weeks old, but Halo 3 packaging was unveiled as well - Standard, Limited, and Legendary. Paul Thurrott has some good pictures. A QWERTY keyboard input device coming this summer. The best part is that it will plug directly into the bottom of existing XBox 360 controllers. "a huge 120GB hard drive (the largest available for any gaming console)"
Hmm? The PS3 has a 200gig HD available. but that keyboard looks weird. I guess it’s one of those things you have to actually hold. I assume it doesn’t work on third party xbox 360 controllers? Would you mind pointing me to a link showing a supported 200 GB drive upgrade option for PS3? That would be very cool, but the best I’ve heard is that you can mod your PS3 to put a new drive in, but that isn’t supported by Sony, so you may void your warranty. Has that changed? "I’ve heard is that you can mod your PS3 to put a new drive in, but that isn’t supported by Sony, so you may void your warranty. Has that changed?" No, it hasn’t changed because it was never true. Not only is it completely supported by sony (http://www.us.playstation.com/PS3/About/faq) the procedure or upgrading it is listed in the PS3 instruction booklet. Furthermore, there’s a simple slot you use to replace the HD, you don’t have to actually open the PS3 to replace it. Actually, a better question is, "Where do people get the idea that replacing the HD in the PS3 isn’t supported or will void your warranty"? Seriously asking, where? That’s interesting – thanks. I don’t follow PS as much as XBox anymore so it’s good to know the HD upgrade is an option – last I had looked (around its launch) the community forums didn’t have a concensus on that.